Our Jerk Hut Downtown Café located in the heart of downtown Tampa has started an open mic night every Wednesday! Join us and share your talents with an amazing audience. 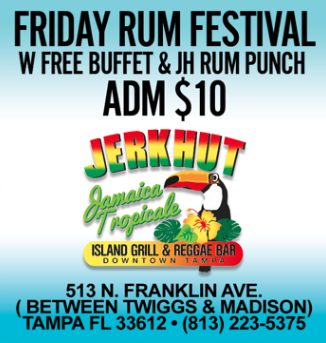 Jerk Hut Jamaican Grille and Rhum Bar located in North Tampa Near U.S.F. has an amazing caribbean lunch buffet Monday - Friday 11am - 3pm. Plus the most talked about Sunday Brunch Buffet in town 11 am - 4 pm. Our Sunday brunch buffet has all your deliciously prepared caribbean favorites served up with LIVE Reggae. On Fridays at our Downtown location from 7pm - Midnight we have our amazing Rum Festival with Tampa's top reggae band —plus an all inclusive Buffet and a tropical Rum punch of your choice all for $10.